Imagine a puzzle game where every step can be the difference between life and death. Spikes, bottomless pits, undead arms and killer plants mean instant demise as you try to reach the exit. Sound intense? Now imagine navigating these obstacles while controlling a second player who moves opposite the first player. That is Fearful Symmetry & the Cursed Prince in a nutshell, control both characters to reach the exit and not die. What sounds simple is in fact quite challenging, and while I did die a lot, I was always compelled to try one more time. 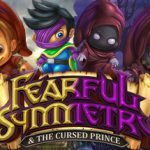 It’s that addictiveness that made Fearful Symmetry & the Cursed Prince a pleasant surprise that every puzzle game fan should experience. The first character you will play as is Hero, a young adventurer in search of treasure. 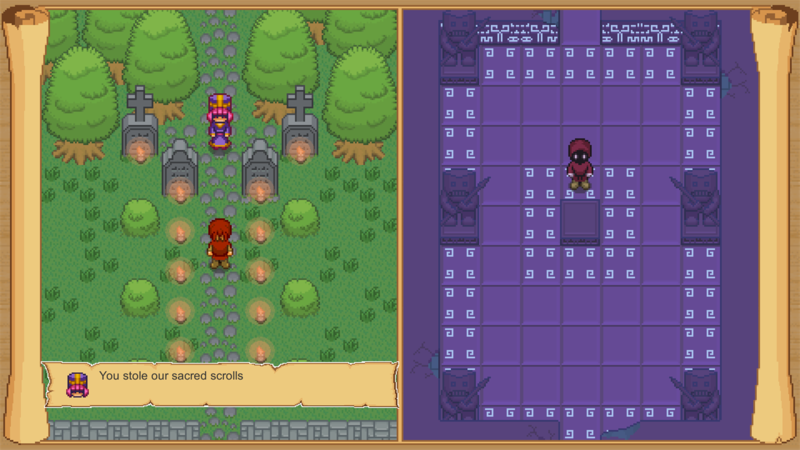 During his search, Hero discovers the symmetry scrolls and takes them, despite the belief they are cursed. In another dimension, a different character is in search of his own answers. The two characters move in opposite directions and are both displayed on the screen simultaneously (the screen is split vertically). Numerous hazards litter the landscape and simply touching one means you must start over. Fearful Symmetry & the Cursed Prince is equal parts think before you act and trial and error. In case you didn’t know, stealing is bad. Played from a 2D, top-down perspective, Fearful Symmetry & the Cursed Prince has gameplay that starts simple but then increases in difficulty. In the beginning it’s easy to spot the hazards and successfully exit an area. Difficulty ramps up quickly as obstacles increase and the correct routes are harder to uncover. Complicating things more are non-lethal obstacles that block one character’s path but allow the opposite character to still move. Thankfully, if you guide one character to the exit, they will no longer move, leaving you to only worry about the remaining character. Despite the difficulty spikes, Fearful Symmetry remains enjoyable and thanks to a few branching paths, you can still make progress even if a particular level stonewalls you. In every main level there are collectable crosses that unlock bonus levels, while not mandatory, they are worth seeking out. Thankfully they aren’t arbitrarily placed in hard-to-reach areas and you likely will grab them without much trouble. 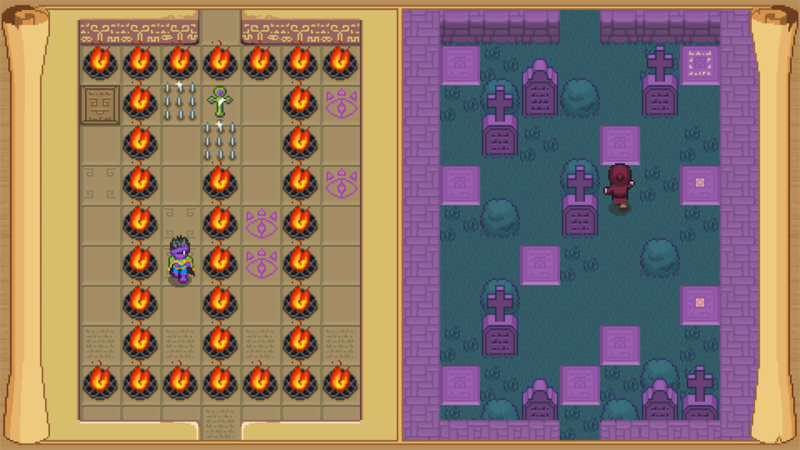 Haim can easily pass over those flame squares, just don’t land in a purple eye. There are 10 bonus levels available that, in addition to extra challenges, allow you to unlock the other two playable characters: Haim and Nulan. Once unlocked you are free to toggle main characters and replay the 20 levels with slight modifications. Haim can warp one space in any direction to bypass walls and hazards. Later on, you will unlock Nulan, who floats and can burn plant-life in her immediate area. The levels are slightly altered to make it more difficult for your character, for example there is a purple icon that Haim cannot touch or he dies immediately. If you count playing levels as different characters, plus bonus levels and the locked section that unlocks after beating everything, you’re looking at about 75 levels total. Fearful Symmetry & the Cursed Prince won’t wow you graphically, but the 2d sprite style looks crisp and clean in high definition. 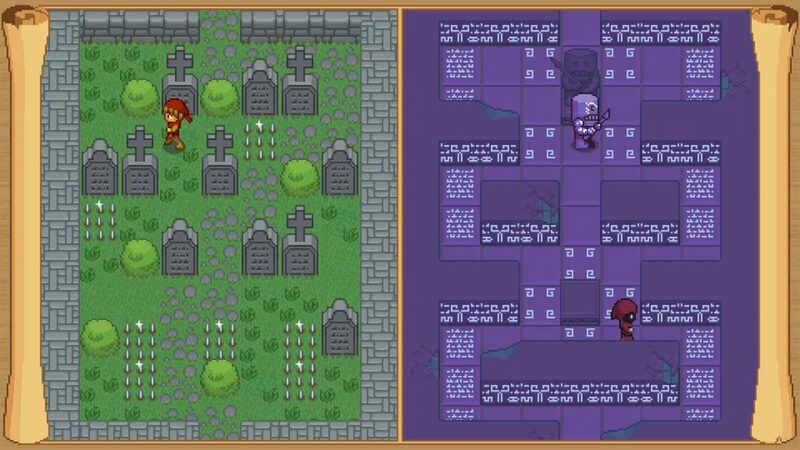 There is typically a contrast between green outdoor areas and purple bleak areas of the dark realm. Loading and restart times are kept to a minimum, but the music and sound is not a particular high point. In some sections you might hear some whimsical flute melodies and another more somber tunes reminiscent of church. Other areas are void of music completely and just have ambient noise such as birds chirping. While the lack of variety doesn’t detract from the experience, it seems like an area that could have used a bit more attention and variety. The stone golem moves when you move, (he is NOT friendly, FYI). I was genuinely surprised by how much I enjoyed Fearful Symmetry & the Cursed Prince and how it kept me coming back. Of course, there were moments of frustration that made me feel like quitting, but I always returned, whether after a few minutes or a few days. I absolutely loved getting an achievement for the first time beating every level, the immediate reward was just the carrot I needed dangling in front of me. Publisher Soedesco nailed the price point at $9.99 USD, as completing the entire game will be more than worth the cost. Overall, Fearful Symmetry & the Cursed Prince takes what is typically a temporary puzzle gimmick and turned it into a great game. A press copy of the game was provided by Soedesco Publishing for the purpose of this review.